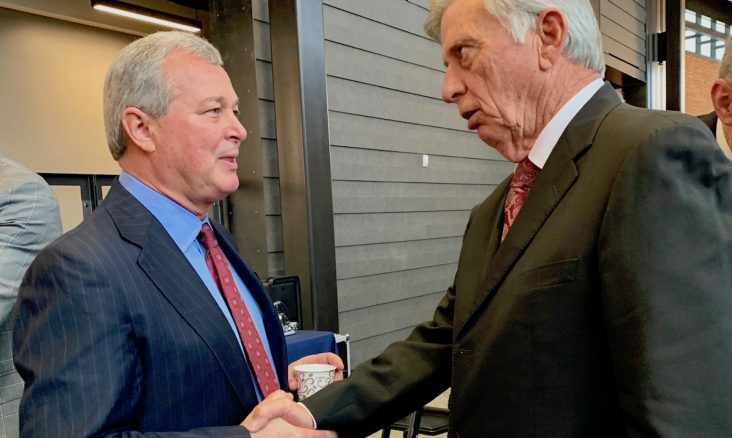 Tyson Foods CEO Noel White, left, shakes hands with former Arkansas Governor and Tyson board member Mike Beebe following the company’s shareholder meeting in downtown Springdale on Thursday (Feb. 7). Tyson Foods may be the nation’s largest meat producer, but in its quest to become a modern food company consumers can expect the company to ramp up investments and efforts to grow its non-meat business, CEO Noel White said Thursday (Feb. 7). 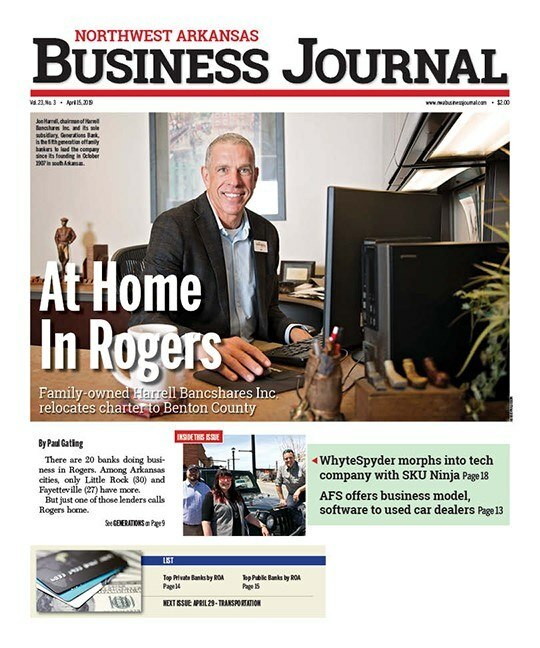 Talk Business & Politics asked White if the investments would be made through Tyson Ventures as an investor in non-meat protein companies like Beyond Meats and Memphis Meats. White said those investments were just one way the company is pursuing market share in alternative meat proteins. He said Tyson was using its own creativity, scale and resources to make protein alternatives organically. He said while the segment is small overall, it’s one of the fastest growing as more people look for meat alternatives. White said the U.S. is behind Europe and Asia in this trend, and Tyson will flex its muscles to ensure alternative proteins are more accessible in the U.S. and abroad. He said Tyson is a protein company and keenly aware of the growing class of “flexitarian” dieters who primarily eat plant-based foods while allowing meat and other animal products in moderation. White said Tyson will always be a meat company at the core, but the move from lower-margin commodity to higher-margin branded food company is underway. The growth of the company’s prepared foods segment is fueling a change in the business and helping to stabilize and grow earnings for the years to come. White said this transformation in Tyson is tied directly to the growth in the prepared food business which in 2014 was primarily selling to foodservice with $4 billion in annual sales. He said the business-to-business model of 2014 was generating low returns of about 1%. The Hillshire Brands acquisition in mid-2014 ($8.55 billion) and other smaller acquisitions like AdvancePierre in April 2017 ($4.2 billion) and the Original Philly Holdings deal in late 2017 helped set the stage for the $8 billion in revenue now generated in the prepared foods segment, according to White. When asked if the prepared foods segment would eventually become a leader in overall operating income for the diverse company, White said the segment already comprises about 30% of the profits and roughly 20% of total sales. He said it’s a meaningful portion of the business with room to grow. White said he was surprised more analysts didn’t ask or comment on the record first quarter results in the prepared foods segment. The segment had a total operating income of $268 million and a 12.5% return on sales. He said the prepared foods segment is key to Tyson’s long term growth and one of the areas where future acquisitions could make sense. White was asked about the meat giant’s appetite for more acquisitions considering it’s still working to integrate Keystone Foods and now the Thai and European assets of Brazil Foods. He said Tyson will have a disciplined approach to any future M&A deals. He said the case would have to be compelling given the company is working to pay down debt and plans to go to the bond market in the coming weeks to finance the $2.16 billion Keystone Foods deal and the $340 million BRF acquisition announced Thursday. He said Tyson can’t control when opportunity knocks, and there is additional leverage ability should a “too-good-to-pass-up” deal pop up. Analysts asked White during the earnings call how deep the company purse is with respect to future shopping. Tyson Chief Financial Officer Stewart Glendinning told analysts the company could finance several billion more in future deals, but the focus will be disciplined and it seeks to pay down debt and keep liquidity high. White told Talk Business & Politics during a brief interview following Thursday’s shareholder meeting that acquisitions would also have to expand the company’s international growth, increase the higher-margin, value-added sales or help stabilize earnings in some other way. Talk Business & Politics asked White for an update on the company’s China business which has been a laggard in recent years. “We haven’t been happy with the results in China, but it’s going much better and is in a position to break-even this year,” he said. White said the team in China made changes to the business, scaling back the number of regions and focusing on eight major cities. The business is also expanding its higher-margin sales to retail and has been more proactive in direct-to-consumer sales via e-commerce platforms. Tyson’s legacy business in China is small and is an integrated system with contract farmers that operates much like in the U.S. White said with the acquisition of Keystone Foods and now BRF assets in Thailand, United Kingdom and the Netherlands, Tyson will likely begin breaking out the international sales as a separate operating segment. The Keystone Foods deal added eight plants and three innovation centers in China, South Korea, Malaysia, Thailand and Australia. BRF, which is expected to close by the third quarter of this year, adds four plants in Thailand as well as a plant in the UK and one in the Netherlands. Tyson also operates a very small legacy business in India. With the growing size of the international business, Tyson brought Donnie King out of retirement to manage the segment. White told analysts King’s veteran experience at Tyson Foods was spot-on for integrating these international businesses into the Tyson Foods family. King has the experience of running chicken, prepared foods and beef and pork. He has also overseen the customer and consumer solutions division. His past experience at Tyson includes plant manager for a poultry operation, being a complex manager and director of logistics. White said Tyson’s growth in the future will be led by the prepared foods segment, followed by the larger international footprint and overall value-added (higher-margin) sales across the business.